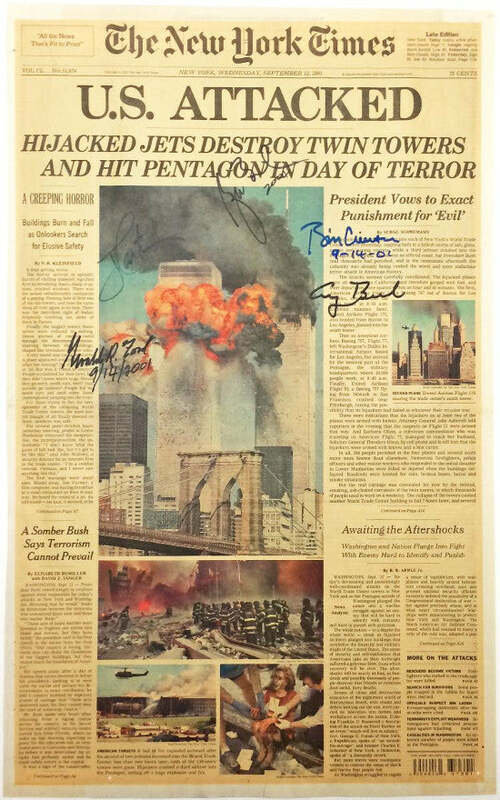 A copy of the September 12, 2001 9/11 New York Times issue, signed by five living presidents, realised $11,000 at Lion Heart Autographs yesterday. Gerald Ford, Jimmy Carter, George H W Bush, Bill Clinton and George W Bush all signed the paper at a memorial service for the victims of the 9/11 attacks in Washington DC on September 14, 2001. The auction house donated its commission from the lot to Tuesday's Children, a charity that helps young people and families affected by terrorism. Please sign up to our free newsletter to receive more news about autograph auctions.